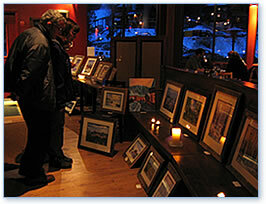 This weekend Kendra is celebrating 10 years of art shows at Sun Peaks Ski Resort. 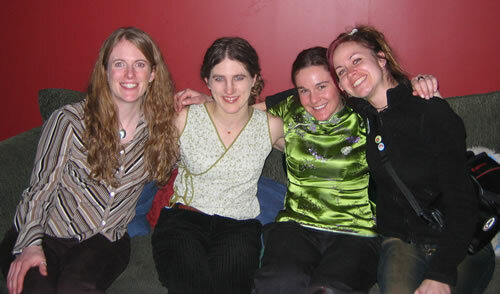 She held her first art show at Bottoms in their banquet room on January 26, 2002. 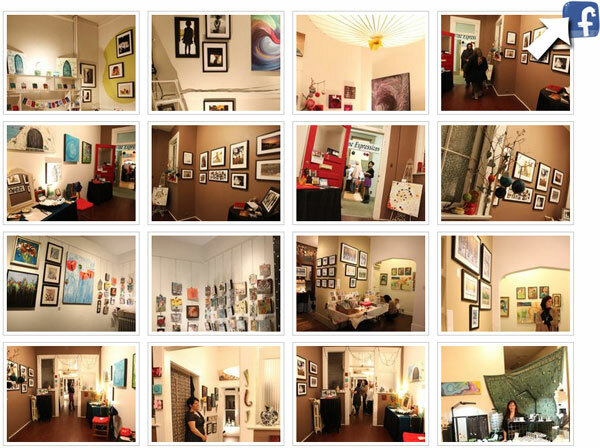 The art show was hosted by Lone Wolf Gallery and buyers would walk down the hallway to pay for their paintings. 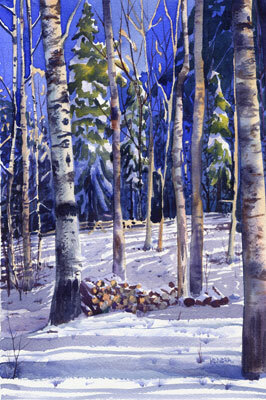 Tree Line Studios opened further down the village the next year and Kendra was one of the first artists to be represented by the gallery. 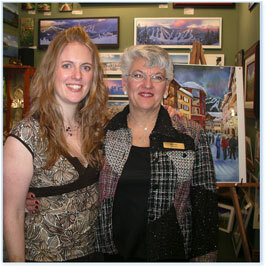 This year marks the 10 year anniversary of Kendra's Art Shows at Sun Peaks. 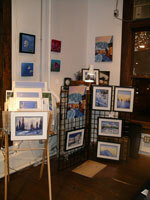 Visit Tree Line Studios on Saturday from 10am to 8pm. Kendra will be in and out throughtout the day but if you don't want to miss her pop by between 2pm - 6pm when she is sure to be there. 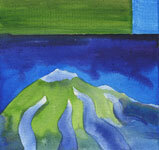 If you are interested in a painting, please call Tree Line Studios at 250-578-2674. 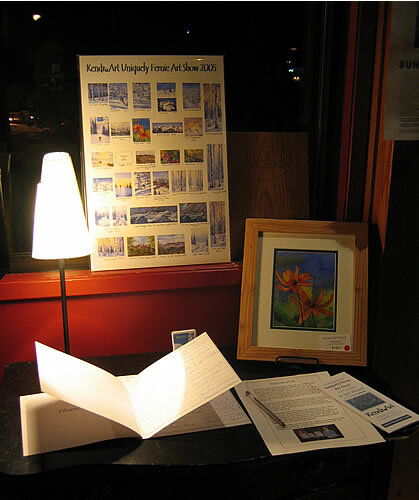 ArtWalk takes place in the Lake Country Community Complex where it showcases original works of art and live performances created by artists in the Okanagan Valley. Beginning April 1st (opening night) the gallery will be exhibiting over 350 original art works priced Under Eight Hundred dollars. 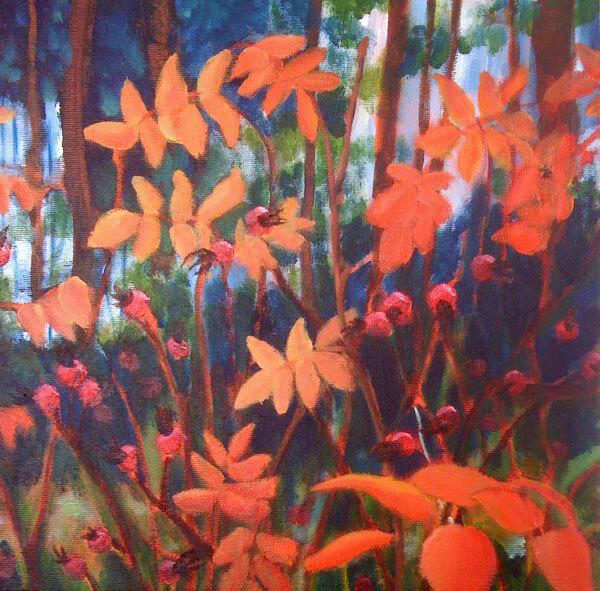 Kendra has a 12x12" acrylic painting in this show titled "Rosehips". The Evans Gallery is co-hosting this event with the Wine Festival Society to display and offer for sale works they have collected over the years that have appeared on the cover of Wine Festival guides. 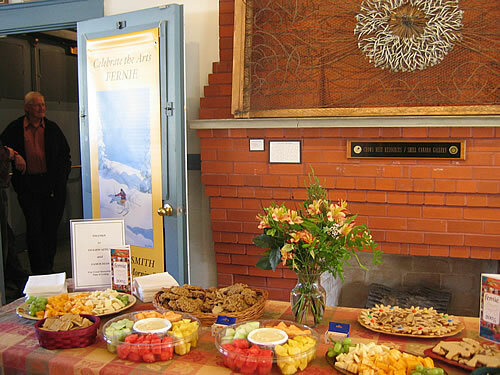 The opening wine and cheese reception will be April 15th from 5:00pm to 8:30pm. 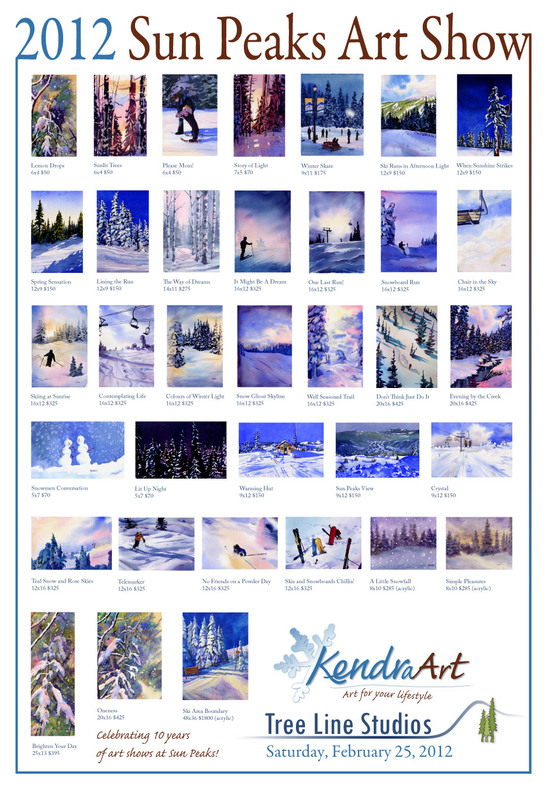 Two of Kendra's pieces will be included; one that appeared on the Spring Wine Festival Guide cover in 2006 and the other on the 2007 Sun Peaks IceWine Festival brochure. This weekend Kendra is heading to Sun Peaks, BC where she and four other artists will be paired with resort restaurants on Saturday, July 17th as guests tour from location to location throughout the stunning alpine village. 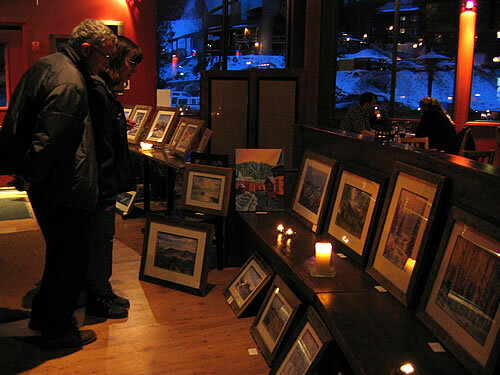 Visitors will learn about various art mediums while tasting some of the finest wines British Columbia has to offer and indulging in sumptuous tapas created by Sun Peaks Chefs. Reservations are required, tickets are 49.00$ per person. For more information you can check out the Sun Peaks Resort website or contact Tourism Sun Peaks at activities@sunpeaksresort.com. On July 18th there is a second opportunity to meet the artists and view our work in the “Art Zone” outside Tree Line Studios in the heart of the village. On the evening of January 22 Kendra will be a guest presenter at Sun Peaks Progressive Wine Tasting event during the Winter Wine Festival. The Progressive Tasting "combines cool wines, talented local artisans, crisp mountain air and good company to create warm and wonderful memories of a Canadian winter. Wander around the charming alpine village while tasting wines from over 20 wineries and watching demonstrations from local artisans". On Saturday, January 23 Kendra will be displaying her art in the lower lobby of the Delta Hotel along with artists Ken Farrar and Sol Metal Designs. 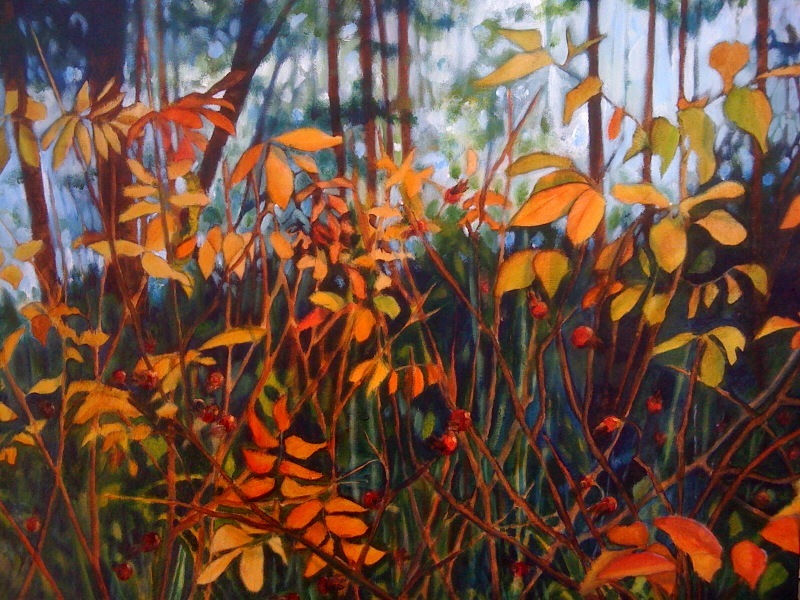 This art show is hosted by the art gallery Tree Line Studios. To purchase tickets for the progressive wine tasting or for more information on Winter Wine Festival events, contact Sun Peaks Adventure Centre at 250-578-5542. 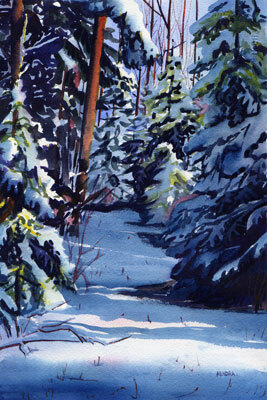 To read more about the art gallery at Sun Peaks, visit Tree Line Studios website, or call 250-578-2674. 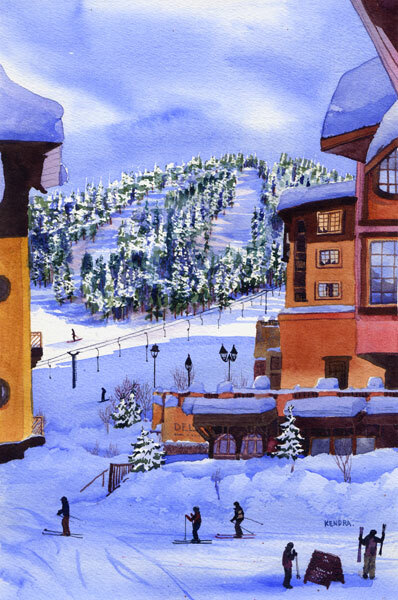 The second annual Wine and Culture Festival will be hosted at Sun Peaks Resort during Alpine Blossom Season. 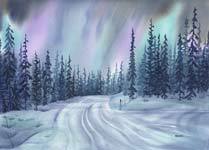 The art festival is 2-4 on Saturday July 18 where Kendra will be set up in a restaurant at Sun Peaks. 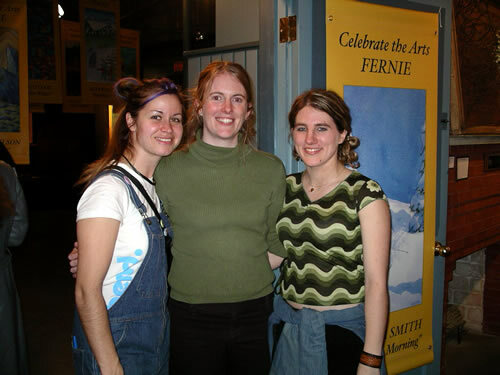 Kendra will share the history of her art career and her passion of art. Kendra will be set up in front of Tree Line Studios from 11am-2pm with three other artists from the gallery. At the same time there is a lively Farmer's Market on Sun Peaks Way, so there will be much to see and do. For more information on the Wine and Culture Festival, please contact Sun Peaks Adventure Centre at 250-578-5542. 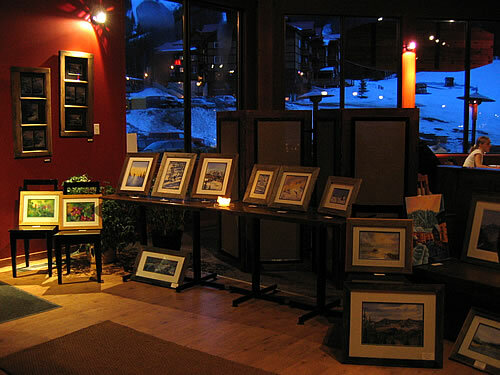 As for the art gallery at Sun Peaks, please visit Tree Line Studios website, or call them at 250-578-2674 for more information. Kendra Smith (now Kendra Dixson) returned to Tree Line Studios on February 14th, 2009 for her eigth annual art show at Sun Peaks Ski Resort, just outside of Kamloops, BC. "This year my goal was to explore my creativity. I had a wonderful time playing with colour, line and design. One of my close family friends said that 'The world today needs lightness and love and hope. I think your painting portray that.' That means a lot to me." 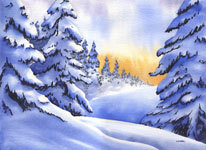 "This year I brought over 25 new originals! People want to see an artist grow and I think everyone will be happy to see that I am still producing new work. A few of my new paintings are really different from anything I've done in the past. To read more about the art gallery at Sun Peaks, visit Tree Line Studios website. 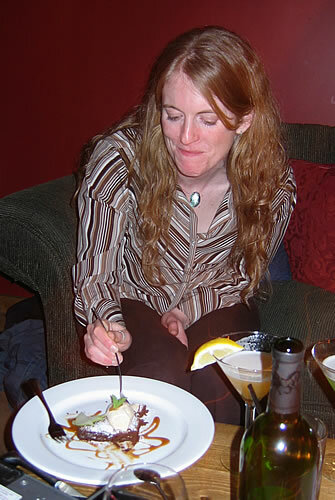 In 2006 Kendra was selected to be the cover artist for the Okanagan Spring Wine Festival guidebook and was the feature artist during the wine festival at Picture Perfect in Kelowna. 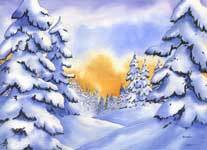 The Wine Festival committee also commissioned Kendra to paint the cover for the Sun Peaks Icewine Festival brochure. 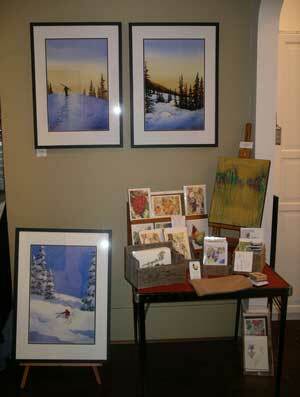 2007 was Kendra's sixth annual art show during the Icewine Festival at Tree Line Studios in Sun Peaks. Click here to see the full brochure as a PDF. Sun Peaks, just outside of Kamloops, BC, is a beautiful ski resort. 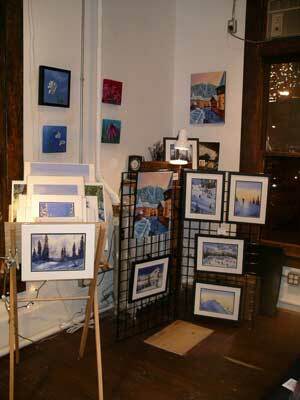 The gallery Tree Line Studios is located in the village beside the Rocky Mountain Chocolate Factory. 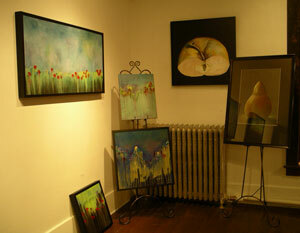 To see photos from Kendra's art show at Tree Line Studios click here. 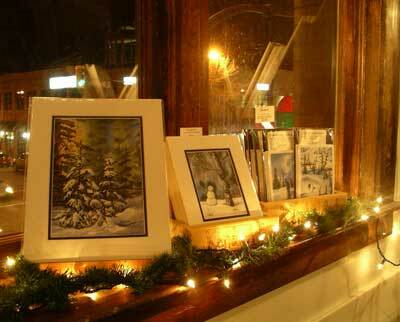 Studios 4 & 5's 4th annual Christmas Art Show Friday, November 26th 5-9pm and Saturday, November 27th, from 11am to 4pm. Are you on Facebook? Become a fan! Read more about how this show got started... Visit my blog! 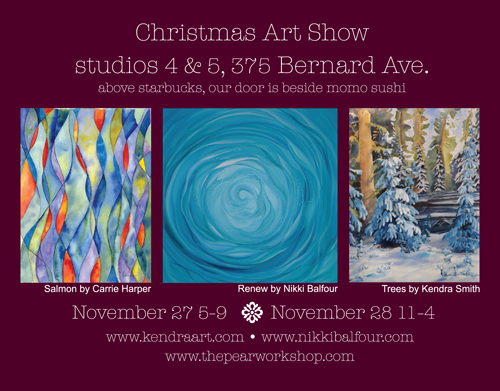 studios 4 & 5, 375 Bernard located upstairs from Starbucks on Pandosy and Bernard. The above originals will be available for $425 framed. 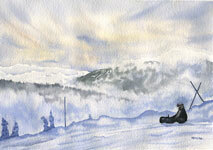 We will have art cards, magnets, prints and other originals for sale too. Kendra Dixson and Carrie Harper painting in their studio. 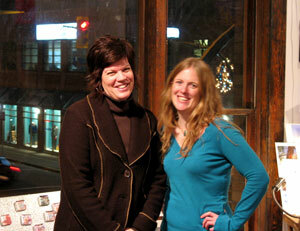 Open Studios is like a studio crawl and my studio partner Carrie Harper and I will be a part of it! We are opening our studio doors and everyone is welcome! "Open Studios promotes recognition that the arts are a significant component of our region and contribute to the public awareness about the quality and diversity of art created in our community. It also provides an educational experience for all ages, which will help foster an interest in and a greater understanding of the artistic process. This program provides a rare opportunity of seeing artists in their own environment and to experience artists discussing and demonstrating their materials and art process." Kelowna Artist and my studio partner. Craft-A-Fair, Sunday, November 2nd at the "Interior Savings Center" in Kamloops, BC. It is the same arena I've been at for the last two years (a few years back it was Riverside Colliseum). Festival of Creations, November 8,9 at Prospera Place, 1223 Water Street, Kelowna, BC. Door prizes! 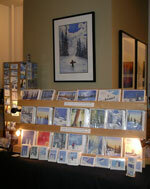 Midieval Market, November 15,16 at Columneetza Secondary School, 1045 Western Avenue, Williams Lake, BC. 10am-4pm Saturday and Sunday. Door Prizes!. 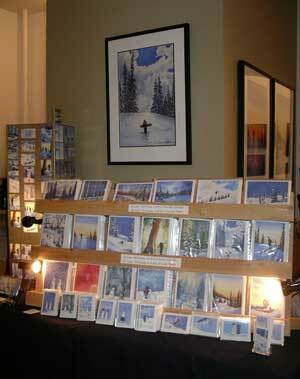 Christmas Craft Fair, November 22 at the Fernie Community Centre, Highway #3, Fernie, BC. Christmas Craft Fairs are a lot of fun for me. It is a chance to be in the public and display all of my new work in an open setting. I bring art cards, prints, magnets and bookmarks. 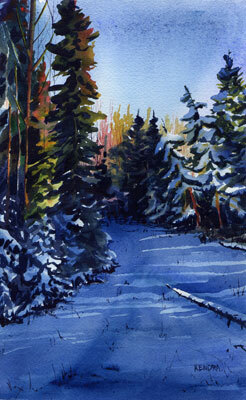 If you want to stock up on cards for Christmas, save money by ordering in larger quanities. Karin Vermassen from Wine Occasions hosted a wine tasting on March 27th at the artists' reception at the Chateau Kimberley Hotel. 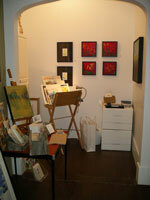 The show was a big success with over 250 people at the opening. We had many comments on the quality of work and the ambiance of the Chateau. The Hotel is actually the old “Cominco Mining Office”. 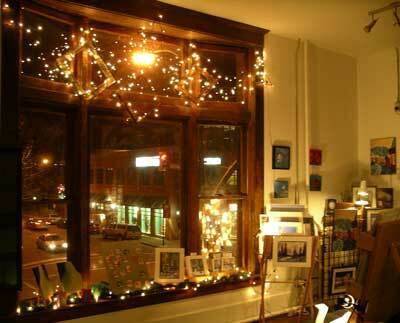 The ambience is wonderful. The Architect who designed it is from Calgary. 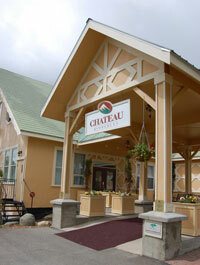 The Chateau Kimberley had an art show last year called “Champagne and Chocolates”. The Chateau had people come in from all over to stay because they heard about the artwork. They had over 200 people attend the opening. The artists in the Creative Expressions art show: Denai Bell, MaryAnn Bidder, Walter Comper, Sandra Donohue AFCA, Janice Edwards, Cory Horne, Lynne Grillmair AFCA, Teresa Knight, Jim Poch, Grant Smith, Kendra Smith (now Kendra Dixson), and Charlene Stroud. 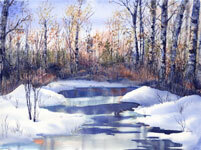 If you have any questions about the art show please feel free to call MaryAnn Bidder at 250 427-7142. 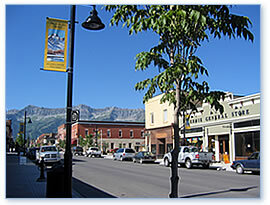 After the artshow, my remaining work was taken to the Fernie Arts Co-op at 572 2nd Avenue in Fernie, BC. 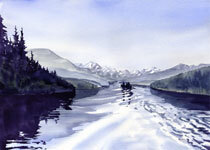 Please call them at 250-423-7044 if you have any questions about my paintings. 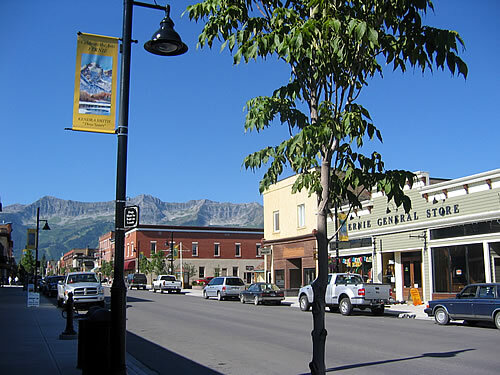 On March 1st, the Craft Connection moved across the street to 378 Baker Street in downtown Nelson. It is one of the finest art co-op gift galleries in Western Canada. This marks the 25th year the Craft Connection exists. I've been a consignment member of this co-operative business since 2002. 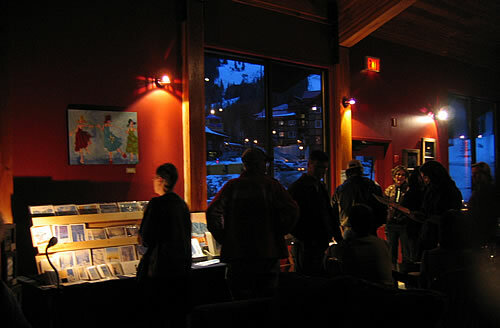 My art show at the Craft Connection in Nelson, BC was so well accepted that it was extended until the end of February, 2008. On November 1st, twenty of my largest framed archival reproductions were displayed, the highest number of framed prints I've ever sent anywhere at one time. 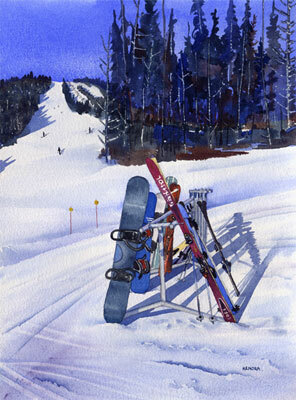 My watercolour paintings range from birch trees in the snow to skiers and snowboarders; there was something for everyone. 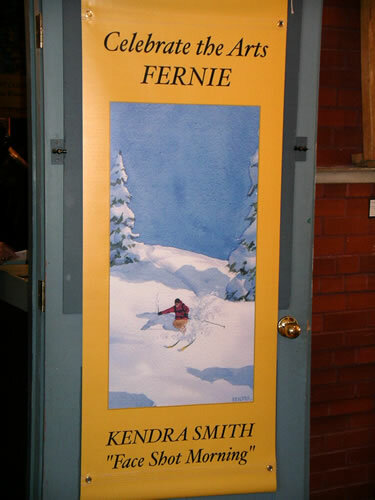 On the evening of Sunday, March 6th, 2005, Kendra held her "Uniquely Fernie" Art Show at the Wood restaurant at Fernie Alpine Resort. Here are a few photos from the evening. Click on these images and larger versions will open for you in new windows. 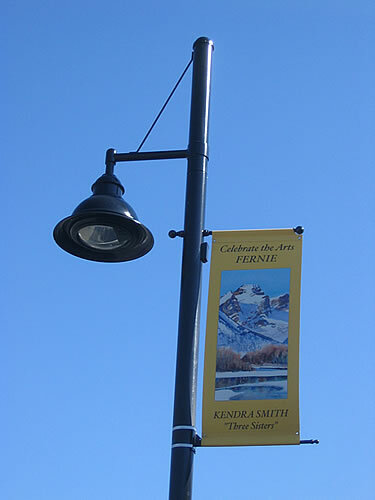 Kendra is excited to be part of the 2005 and 2006 Fernie Banner Projects and has had three paintings featured on banners in historic downtown Fernie. 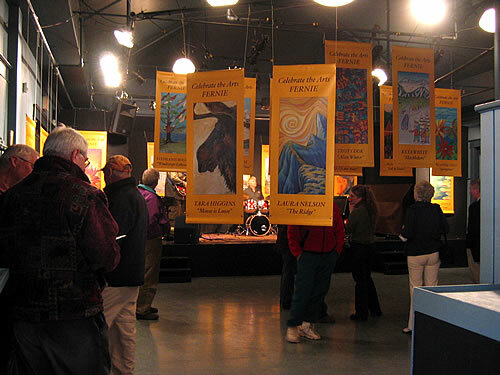 The project was initiated by local resident Linda Hide who organized recruiting artists, secured funding and ensured the banners were produced and ready to launch this spring. 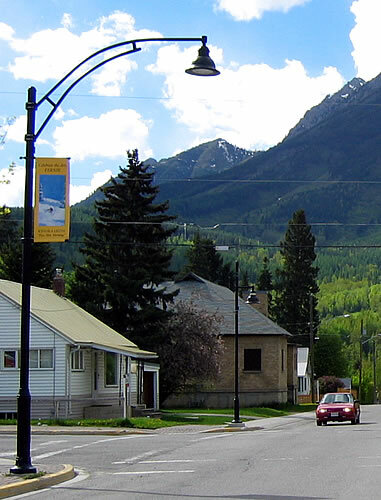 In addition to Linda, the Fernie Banner Project would not have been possible without the efforts and support of: The City of Fernie, The British Columbia Arts Council, Jennifer Girard, Kevin MacIsaac, Terry Nelson, all of the contributing local artists, and the sponsors. 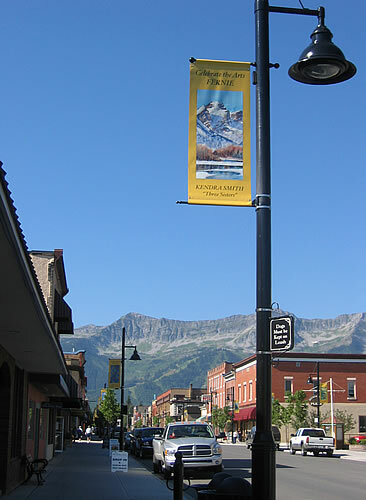 Next time you're in Fernie be sure to check them out the city banners filled with local art. Click on the thumbnail photos below to view larger versions of these images.